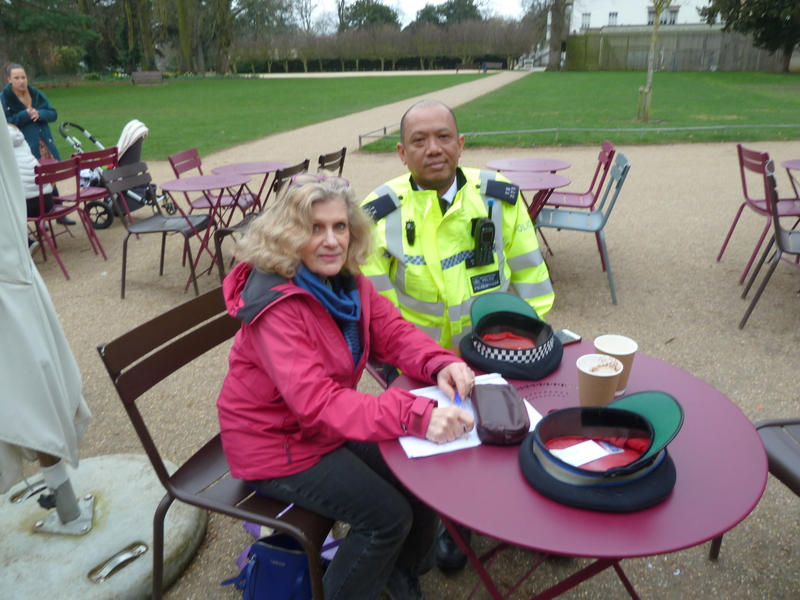 Police to the rescue — when researching for my detective novel a great source turns up at the local Chiswick House Café. Community Police Team heard out my tale of an alternative therapist who finds a body in the woods in Chiswick — what happens next? Real police for the real deal from what they wear, what the skipper decides, is she under suspicion, to when CID comes in and how they’ll track that car. And the difference between harassment and anti-social behaviour. Doing their duty, Constable Aung (with me here) and Office Kingsmill wish to reassure the public that Chiswick is safe. But they also like a good story — so that’s two fans for my Julia Deogracias and A Body of Knowledge?